Let the kids burn off some energy on the football field at Bella Austria campsite. Want to have a closer look at Bella Austria campsite? If you think Bella Austria campsite in St Peter Am Kammersberg is the holiday park you, why not have a closer look, and check out prices and availability. Bella Austria campsite family holiday park has 200 pitches. Eurocamp have family holidays parks all around Europe. Bella Austria campsite (AU019) is just one of the family holiday parks in St Peter Am Kammersberg, Austria. Have a look for other holiday parks in Austria. You can also see what other people though with the reviews of Bella Austria campsite. These are the reviews for Bella Austria campsite. There are 20 reviews. Staff were helpful and friendly. Shower and toilet facilities were very clean and tidy. Safari tent was very nice however we had to share it with a very large number of earwigs! aside from that no complaints. Very basic site being currently renovated. No internet despite it being advertised. No grill or oven in cooker , swimming pool . too small for all but children , no cards. Taken at resteraunt otherwise a lovely setting. And clean tidy and not crowded. We had a great week in austria. Would have been great to have the swimming pool available as it was so hot. . points to add to pre-holiday planning emails about austria .. shops are closed on bank holidays and sundays . no exceptions. We were caught out with two days of not being able to get any food shopping. Last point is to ensure holiday makers in the safari tents know they need to bring a lighter or matches for using the cooker, every detail of camping equipment is provided except this. Great holiday and would recommend the park to families and couples alike. What a fantastic site, the lack of cooker in the van, is not as problem as the on site resturant is second to none. 3 course meal and drinks €35. Locals very friendly, veiw from camp site 10 out of 10. Key camp courier very rude from start, did not get warm welcome, he was full of himself, talked like he owned the site but when asked if we could have a bbq we was told that there was only three bbq between five caravans , only way of cooking , no oven in caravan. We spent two weeks at this site and maybe it would have been better had the weather been good. We like walking and sight seeing but we were rather curtailed by the weather. This is a lovely small campsite, in a stunning location. The site was clean, and quiet at night, despite being next to a road. The road was quiet enough for us to ride our books along without any problems, in fact we found the austrian drivers quite considerate. the on-site restaurant offered a good variety of meals at reasonable prices, although the service wasn't always very good. The on-site pool was nice but very small - too small really for my daughters aged 13 & 10. There seemed to be some activities organised at the campsite, but we tended to do our own thing. The location is beautiful and we enjoyed some lovely bike rides, I can recommend getting the train from frojach to unsmarkt and cycling back on the cycle path. Not an enormous number of options for eating in the nearby towns and villages, but there was enough. the tobogganing in sankt lambrecht was a fabulous experience - we had lunch at the on-site restaurant and received a voucher for a free ride, which we took advantage of (eat first, next time!). we would also recommend the outdoor pool at judenberg - spotlessly clean and not at all busy, the whirlpool area is a real white-knuckle ride - for strong swimmers only. Great holiday, and would love to return. The holioday park was in a lovely position, we were fortunate in that we had a moble home at the very end of the park in a quieter area an with a lovely view. The mobile home did not have an oven and we were not made aware of this at booking, my understanding of this was ovens were removed becuase they did not comply with austrain health and safety rules. We had lovely sunnny warm weather while there. It was very windy and the umbrella provided was not fir for purpose, we could not use it during the day and had no protection from the sun after mis morning. All other companies on site apart from keycamp and eurocamp provided families with a covered eating verandah area in which you could utilise in any weather. The pool was small and not really suitable for adults and we did not bother to use it. We went to the local town and used the outdoor pool there instead. The mobile homes were cramped and poorly designed for a park such as this. The double doors outside took away a lot of space that could otherwise be utilised. My feeling is that the mobile homes were not suitable for this type of park and different models should have been installed instead. Austria is not known for having constant sunshine. The park although adequate for our needs, would not suit a family with older children, there is nothing to do and it is situated quite a distance form the local town. . overall I feel irritated by the design of the mobile home and the use of parasols outside in an area known for having strong gusts of wind. My feeling is that the mobile homes do not present as good value for money and are not fit for purpose on this site. 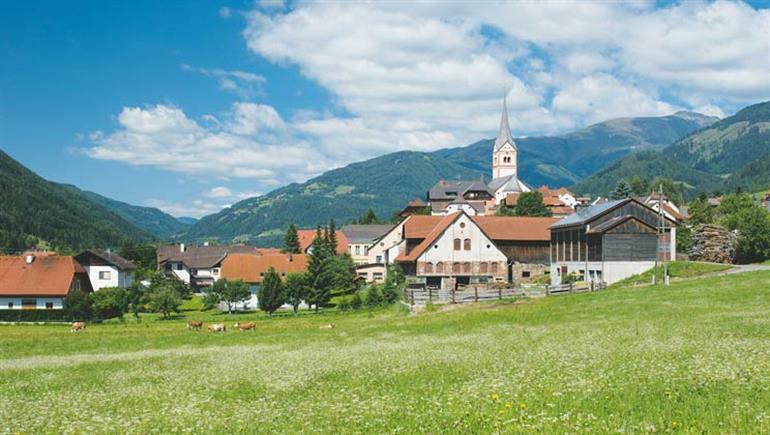 This area of austria is very picturesque. We had wonderful holiday. I was here primarily to race the ironman austria triathlon but we also had great time sight seeing in the mountains, hill walking and just relaxing in a very peaceful environment. Courier here in austria wants replacing.